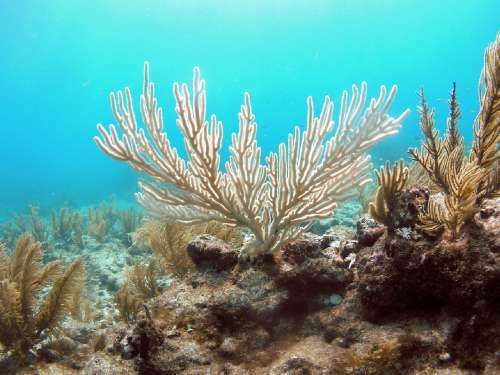 Claim: Ocean Warming Affecting Florida Reefs | Watts Up With That? ST. PETERSBURG, Fla.— Late-summer water temperatures near the Florida Keys were warmer by nearly 2 degrees Fahrenheit in the last several decades compared to a century earlier, according to a new study by the U.S. Geological Survey. Researchers indicate that the warmer water temperatures are stressing corals and increasing the number of bleaching events, where corals become white resulting from a loss of their symbiotic algae. The corals can starve to death if the condition is prolonged. The new analysis compares water temperatures during two time periods a century apart at two of Florida’s historic offshore lighthouses – Fowey Rocks Lighthouse, off Miami, and Carysfort Reef Lighthouse, off Key Largo, Florida. The first period included data from 1879 to 1912, while the second period spanned from 1991 to 2012. Temperatures at a third area, a reef off Islamorada, Florida, were also monitored from 1975 to 2007. The study indicates that August is consistently the month when Florida’s ocean temperatures peak. In the analysis of recent decades, average temperatures for August have been at or very close to 86 F. At Fowey Lighthouse from 1879 to 1912, the average August temperature was just 84.2 F. Temperatures this August at the same location, though not included in the study, averaged 87 F.
Coral bleaching is currently underway in the Florida Keys, highlighting the real-time impact that warmer ocean temperatures are having on reefs. Corals can recover from bleaching if the waters cool down within a few weeks, but mortality usually ensues if corals remain bleached longer than a month or two. The study, “A century of ocean warming on Florida Keys coral reefs: Historic in-situ observations,” was recently published in the journal Estuaries and Coasts and is available via open access. September 10, 2014 in Sea Surface Temperature. Coming out of the LIA, is this surprising? Not likely. Does it make for another bedtime Boogeyman story for the naive? Likely. Unlikely to happen, because (a) that would be real science, and (b) the environazis would be pooing watermelons at the prospect of sacrificing a narrow trench of coral. Isn’t it true that all the other “bleaching events” worldwide have been due to the coral changing out symbiots to enhance production? What is to say that when this diver returns to this same spot in six months that the pictured coral stalk won’t be returned to normal appearance? But does the ‘study’ here indicate whether there was any coral bleaching 100 years ago in the cooler water temperatures? Isn’t that rather important to whether we even care about the temperature of the water (or whether the corals and their symbionts care?) What if there were more bleaching back then? Has any one heard of a control group? What other causes have been considered for coral bleaching and which have been ruled out? 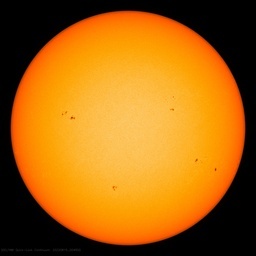 Since it is sunlight that of course warms those waters, what do the solar cycle SSN’s look like for those two period? This must be where the missing heat has ended up. Must be on vacation. It’s gotten to the point that when I read “study” in the lead-up to a story about some gawd-awfully alarming warming, I just shut down. The word “study”, along with “scientists” and “could” basically shuts down any further desire to know. One knows in advance that whatever follows will be speculation, and gloomy speculation at that. It is the corruption of science in this field that warrants extreme prejudice. Sorry, but you will have to prove that assertion. The vast majority of the alarmed “climate scientists” in those deeply flawed scientifically meaningless 97% surveys, are not specialists in the CAUSES of climate change (attribution), but in the impacts of and remedies for such change. Most know zip about atmospheric studies. They may know a little bit about how in such and such region there was a drought, or a flood, and in that region these species were harmed, be it plants, animals, etc, (or just like this study, coral) and they then look at some stupid (wrong as in all have failed) climate model (which according to all the observations are off by a factor of at least three) that says, “It worse then we thought, these events will increase in the future if we do not tax the air you breath now”. John Cook, an Australia-based blogger, and some of his friends reviewed abstracts of peer-reviewed papers published from 1991 to 2011. Mr. Cook wrongly reported that 97% of those who stated a position explicitly or implicitly suggest that human activity is responsible for some warming. Cooks paper, which you support, is scientifically meaningless, besides being wrong on many other levels. I will look at this paper but likely it follows the pattern of all the money grabbing “scientist” who run to the nearest anomaly, and blame it on man. Say, how’s the laughing gas study going? No, that was your construct. Wall Street and corporate billionaires out of millionaires or do you want to give government more money to give to some dictator to refurnish his castle and hire more mercenaries? Maybe we need to give money and guns to the Middle East as Kerry wants because we disrupted their climate. That’s the choice they offer…No Other. Maybe Peter meant to say, Science performed by Climate scientists should automatically and always be accepted as proven, undebatable, truer than God, more powerful and compassionate than Jesus and all other scientists should quit their jobs and bow at their feet. More likely Peter is making an attempt at equating calling out bad science with not believing in science, Peter should try again after he figures out cutting your hair with a lawn mower is bad science methodology. The first sentence of this abstract, “There is strong evidence that global climate change over the last several decades has caused shifts in species distributions…”, at least did not make any claims to the cause of global climate change. Unfortunately, it did not look for any local reasons for the temperature changes, even though it was a specific localized event (the waters off two lighthouses in Florida), or since it was shallow waters, solar activity could be a factor, or even simple evolution. Is it so unusual for species distributions to change over centuries? I get different kinds of ants and insects in my backyard every year, but I personally am not jumping to the conclusion that global climate change affects annual species distribution even though it seems there are many who would. Ah it’s all human folly so why bother with any scientific investigation, writing papers and so on. If you already know the answer, just get a “Global Climate Change” stamp, and for every local event the world over a scientist does not like, climate related or otherwise, just rubber-stamp it “Global Climate Change” and be done with it. Do we not all agree on that? How much and to what effect is the question. You live in the US? Australia? Better batten down the hatches to keep out of all those hurricanes and cyclones coming your way from all our global warming caused by voting for right-of-center politicians. Peter, Richard Tol destroyed Cooks methodology as a statistical paper. There is nothing left. Now THAT’S funny. I was right, this IS fun to watch. Has anyone checked to see if corals are now growing farther north than before? If the water is warmer at these locations then it would be natural for the water to be warmer far enough north for coral to grow today than in the past. That would not be a bad thing IHMO. Has anyone checked if there are corals growing further south? If they mange that, why are they so sensitive to warmth at this particular location? I seem to remember that only a few years ago it was unseasonably cold in Florida and this was killing the coral??? … and our citrus industry has moved further south because of frequent frost global warming. How could you leave that place. I could spend months right there epolxring the reef. I got my scuba certification after snorkeling the coral reefs when we stayed at the Princeville condos on Kauai. The water was 3 1/2 feet deep for 600ft then it dropped off to 60ft at the end of the coral. There was huge parrot fish all sorts of needle nose, tangs, rainbow wrasse, clown and angel fish. I got lucky one day and saw a sea turtle that I couldn’t catch and two giant manta rays.The first time I was there I’m gonna guess was 75 or 76 . Whichever it was the movie Jaws had just come out. That movie was not exactly a boon to the scuba industry. I had to snorkel for the first time days after seeing that movie. But I had a plan. Any time I went in the water I would place my scrawny 90lb. frame right next to the fins of my dads delectable fat juicy 245lb. shark family platter of a body. Thinking that my odds of survival increased significantly if I swam next to him. We also had a warmer period between 1915 and 1945 – why did they not include that period also?? This site works pretty well as a forum. You can’t reply with traehd after traehd like in a conventional forum, but you can still edit your question/answer to reply to what people have said. The only real difference is that you have to frame the topic of your traehd in the form of a question, but I actually like this. It gives more direction to the traehd, unlike in many forums where someone will simply post a link or a comment with no particular direction and the traehd quickly goes completely off topic. There are also a lot of very knowledgeable people here from a wide variety of backgrounds and stances on global warming, and many of the regular’ posters here have been participating for several years. But if you really want the more traditional forum’ feel, most political forums will have a section on environment’, which usually has quite a lot of global warming related topics. Just Google “political forum” (without quotes) and you will find hundreds of results. But I know where you’re coming from. I was pretty surprised when I tried to find an internet forum dedicated entirely to climate change and didn’t find one. There are thousands of blogs, but not many conventional forums’ in the strict sense. In other news: studies report that due to ClimateChangeTM sea surface temperatures have increased by an average of 5C since the middle of the last Pleistocene glacial maximum. This rise in temperature, which could have been (and likely was) even greater in local and regional areas, profoundly affected corals. Actually every single coral reef from that time is long dead because they are now 400 feet below the surface. Our current coral reefs are all less than 12,000 years old (though mlost are on top of old reefs from the previous interglacial 120,000 years ago. live for all that long. All these alarmist fears always act as though everything has been as it is today forever. Any organism that exists or has existed on Earth has had to either adapt or migrate or become extinct. And that includes humans. The results are irrelevant – more funding for the USGS that’s more important. Good work chaps! So, 2 degrees over a century. But which value is “normal” – the low or the high? Did the end of the LIA play a role? Don’t fall for the lies. Corals survive in a rlateively narrow temperature zone. There have always been corals that try to survive in waters that are nearly too cold and they often die of cold. Corals that live in water that sometimes is too warm also sometimes die but in this case they die because the water is too warm. When someone wants to push an agenda, they visit corals that are suffering from warming waters and pretend that is a threat to corals in general. It is a lie and it is to push a socialist agenda. It is more evidence that the global warming alarmism is more about politics than science. This warming that you suggest is killing off corals will help any corals that are living at the cold extreme of coral tolerance. Aren’t you even the slightest bit curious why you never hear about the benefits of the warming on these corals. Don’t be gullible. Be skeptical of these sort of claims. They are generally grossly exaggerated. I don’t find this study to be credible, not least because I don’t believe there is any consistent temperature measurement from decades ago, OR now. Lifelong Florida resident for +50 years. Florida waters range from the low 60’s to upper 80’s every year. Every. Year. And somehow these corals survive, which we’re regularly told is impossible, because ‘corals can’t withstand even slight temperature variations.’ In my life I have regularly seen 88 F or 89 F surface water temperatures in the Gulf of Mexico and near-shore waters of the Keys during summer. The reason for this study is the Florida Keys demonstrate that corals are not nearly so fragile as the Team represents them to be. Oh, we’ve also been told it’s the dust from Africa causing the coral die-offs. And Asthma. Evolution is a wonderful thing. Why should it be so surprising to some scientists that Coral could adapt to various conditions? Another unanswered question for climate science. I also wonder if the lack of hurricanes in this region since 2005 have anything to do with more heat remaining in the water there. How exactly do we know how warm the ocean was in 1879? Who took the measurements? I understand the alarmists don’t trust measurements taken by humans with thermoniters just a few decades ago and will subtract a degree or two to “adust” the records. (recent story at JoNova’s place on that) And now we have exacting water temps more than a century old. Amazing is it not? Corals have adapted very successfully to the shallow water photic zone in which they live. One of the successful adaptations is found in the early larval stage of the lifecycle. Sperm and eggs are released in large quantities into the water after fertilization the young larvae are planktonic floaters. The larvae become widely dispersed then settle to the oceanic substrate. If conditions are ideal these will begin to grow and form colonies, while poor or bad conditions will result in their death. Such an adaptation ensures that coral will survive. Therefore new larvae are always “seeking” out the best areas for survival to form new colonies. If conditions such as temperature, salinity, water turbidity etc. do not exist in the vicinity of the reef, be assured that the larvae from that reef will find the best living conditions to nucleate new colonies. If higher water temperature stresses a colony, some of the planktonic offspring will descend to a substrate with more favorable conditions where a new colony can nucleate. that is why corals have been around for almost a billion years. Now if only global warming would kill roaches. …. unlikely. How are we supposed to take such studies seriously without a robust and contiguous temperature record? Divining trends based on a handful of data points like this does not constitute real science. It’s just a bunch of fluff designed as an excuse for a press release. variation in temps is not normal and , furthermore, that warming will continue into the future. The algae forced out of the coral are usually replaced by another species of algae that can thrive under the condition. So the point is that Florida may get coral with algae that grows in the Caribbean where the waters are a little warmer. Different species, different ideal temperature. White coral just is posting a sign for new algae wanted. It occasionally means dying coral but from a number of other stress causes. Think of the coral growing in the Red Sea, temperatures are nowhere near the 80s, but thrive the do. This suggests that there is a long evolutionary history in which the corals learned how to adapt to a variety of temperatures. Why were the 1970s excluded? Cause that’s where the other “hiatus” was. There’s a paper or two out there by Real Scientists ™ that look at how the oceans behave during cooling. Typically they show that the Gulf Stream slows down, and Europe freezes… One took a look at Florida. (Last time I followed the link to it, it had become paywalled… but it was open once and I did a posting about it). What they did was look at things like pollen in lakes in Florida (along with other things). What it showed was that when the Gulf Stream slows down, Florida has a bit of a heat ‘back up’ and the winter weather gets more like the summer weather. i.e. not cold and dry, but warmer and wetter. IIRC, they showed that the oaks vs pines shifted during those times (along with some other plants) and basically showed that the place warms up. Enough to shift the balance of dominant species. Now, per corals: As this cycle has happened every single ice age glacial of the study period ( a very very long time) those corals have had plenty of exposure to variations of temps. BTW, much coral bleaching has been traced to sunscreen that in ppb concentration can kill them. Want to bet those researchers were using sunscreen in the study areas?… IF they have not controlled for sunscreen concentrations (in ppb or even ppt) then they have no clue what is killing the coral. It is just a bogus paper; But the publisher was very happy to receive the publishing fee. These were the main reasons for coral die offs near mainland Florida in the 1980s and later (and in Jamaica, and elsewhere in the Caribbean, but not yet in places like Belize, as far as I know). Hopefully the corals near the Dry Tortugas are still pretty healthy. Virtually all of us want health coral reefs. This kind of alarmist article is about keeping the troops in line for the global warming battle, in my opinion. If it were about recovering coral reefs, it would be about reducing pollution and overfishing, and restoring algae grazers. We all know that higher ocean temperatures can cause coral bleaching. Most of us do now know (yet) that in the great majority of cases, healthy coral reefs — those not yet degraded — recover and regrow, even with warmer waters. The inferences are standard CAGW, and almost certainly biologically wrong. I snorkel and dive these coral reefs from the Keys to Fort Lauderdale. The alarmist tip off is 5 sites in the Keys, e.g. Islamorada. The problem is urbanization (development) and the subsequent sediment and detritus laden rainwater runoff into near shore waters inhabited by the reefs. Not to mention that treated sewage eddluent is also usually piped to sea since there is no where else to put it in those parts. The decomposition of the ‘pollution’ generates trace amounts of hydrogen sulfide, a classic problem in any saltwater aquarium filter. The L50 of H2S for coral, shrimp, and crab is about 30ppb! Disrupts their oxygen metabolism, worse than cyanide. There are a number of oceanographic and marine ecosystem papers that document this as the main problem for coastal reef bleaching, in excruciating detail. BTW is also true for Australian Great Barrier reef bleaching events, which usually follow flooding and the associated sediment laden runoff into the ocean. Often, the reefs can eecover if the ‘pollution is a pulse and not continuous. Warmer water accelerates the organic decomposition, so raises the H2S concentration. That is the temperature link. Wrote about this in the essay shell games for the upcoming book. Details there, not here. I wonder if the recent absence of tropical storms and hurricanes around Florida has anything to do with the reported higher SST at these particular locations. These storms transport heat from the oceans to the atmosphere and to the land. Also, I took a look at the HADCRUT temperature record for Orlando in the center of the Florida Peninsula, and it has been trending slightly cooler for the last 60 years. Just take a look at where orange trees grow and survive the winter now compared to 1950’s and 60’s. Looks like they compared -AMO to +AMO and found it was different. Amazingly brilliant these clientologists. That’s what I was thinking, too…or don’t they recogniise the AMO as a valid process? Well after pulling their supplementary data, they are not actually measuring the coral reefs, just some lighthouses built at the outer edge of the reef and not even the same lighthouses or same locations. The only close records are all at Fowey rocks which is the extreme north edge of the keys very close to the gulf stream. Peak temps were greater in the 1878 time frame but that must have been massaged out of the data somehow, averages can be very convenient. Further the record is not continuous nor of the same points, their 32 year span is not a single span of a single point compared to another 32 year span. So I am thinking garbage in garbage out. It would be interesting to include data from the entire period 1870 to present, except of course that doesn’t exist. Bleaching of coral as a previous poster pointed out is just the corals request for a new type of algae, happens all the time. Staghorn and elkhorn coral was a big collectors item at one time as well as being very susceptible to damage from careless divers. Finally not a lot of data on the condition of the coral reef from the earlier period, as far as we know it could have been the same, worse or better. Anyhow not a very careful study. OMG now warm water that kills coral? I always thought it was cold. If not, why aren’t there coral reefs off Long Island.? Nice circular argument. Ocean temperatures increase because of global warming, and global warming is measured through increasing Ocean temperatures. I downloaded the raw temperature data from the SI section of the report link. What I was looking for was the depth of the temperature sensors. I did not find it in a quick look; I’ll take a more thorough look later. As any diver knows, there can be sharp thermoclines in the ocean. Temperatures at the surface seldom survive a descent of even 10 feet, and boy do you notice them when you pass through. I was diving in Bonaire in April; Panama City, Florida in June and Hawaii (big island) in August. I would have loved to see water temperatures at 84° (F) in any of those places. Instead at any depth I could be fully submerged where there was anything interesting to look at (including corals), water temperatures were always in the 78° – 81° range (my dive computer records water temp). In other words, the water temps at the measured locations might not be a valid proxy for temps where the coral live. Yes and, this projection of bird extinction was released by the Audubon Society and appeared on the front page of my local paper tonight. The irony is, they’re probably right, but not because of Global Warming. Because of the hilltop cuisinarts that will be dotting every hilltop in the future. This is too goofy to be true. I’ll have a post about it in the morning. Unbelievable. Their buddies have just recognised that the oceans impact climate (main driver of climate) … these guys need to get with the story that the air above the oceans has bugger all impact on anything other than their funding. They might also acquaint themselves with the fact that corals in vast areas greater than modern times existed with sea temperatures greater than modern times. They might acquaint themselves with the Red Sea coral habitations. Nice observation. Had not thought about the Red Sea temps. Ah, isn’t life’s biodiversity wonderful? Except Coral Bleaching in the area has been pretty conclusively linked to dust from Africa. But the studies coming to that conclusion were done by old white males who did not have the benefit of the enlightened world view that is required to do real science. Those old studies can be safely ignored. Or could possibly a correlation between the DEPTH of the water in which the coral grows? shallow/warmer, deeper/cooler. and could that be related to storm surges/ hurricanes and the beat goes on. One answer to one problem related to mother nature never works, and for me anyway climate always changes and have effects every where. day in day out, year in year out. You conveniently forget to mention that cooler water also causes coral bleaching. Meanwhile China is literally bulldozing coral atolls and reefs in the South China Sea to make islands for military use. Warmer than the 1930s? Certainly no warmed by the transfer of radiative co² energy into the oceans. It’s downright ridiculous, that narrow-minded people only look at the Highs while losing sight of the Lows in times of a “Global Warming” hysteria and never vice versa. Are they all so obtuse not to include the overall picture into their conclusions? This behavior can never ever be science ion the least. Sounds like they are trying to cover up for the damage done in 2010. Blathering Idiots, they are. Any good marine biologist knows that corals expel their symbiotic algae at various temperatures in order to take in a different one. If these idiots came back three or six months later, they would find that the corals were all colorful again. Duh! Clearly the coral reefs are having environmental issues around the world. But this has little or nothing to do with CO2. First of all, the reefs are ancient. The temperature rise in the past decades is hardly unprecedented over the eons of reef life. Keep in mind, from 12000 years ago to 4000 years ago, sea level rose 54 inches a century on average. That dwarfs the rates today. Second, the reef in nearby Cuba are pristine. Why are the keys ruined but Cuba is fine? Kind of rules out “global warming”. I guess communism has at least one benefit. I don’t know the details, but some folks say the over-fishing/loss of the Parrot Fish is the problem. The Parrot Fish chew on the reefs and clean them. Perhaps someone with more knowledge of this could comment. If I had authored this paper I would withdraw it with an apology after reading these comments and seriously consider a career change. If I decided to stay in climatology I would completely rewrite the paper using the comments as a guide to make my paper more robust and accurate while also making sure that the paper was not biased with any preconceived outcome, agenda, or funding. But we all know none of those things will happen because this is not science, it is propaganda. There is the “slight” change in the prorgam. It’s actually not global warming anymore, since earth is cooling down since 2005 it’s now called climate change instead. There is also the slight misshap of the temperatures rising a few years prior to the rise in the levels of CO2.I’m not going to go into details on a high school question but you might want to look into climate gate (it’s true, the mails presented by what is American party in the US was taken out of context but I’ve read the mails decided fo myself and the pro-climate change propaganda is based on B.S. and even the ones spreading it know it) and you might have a look at articles google-schollar finds.IMO: it’s a politically based nonscientific topic. A war between American republicans and democrats that spread over the rest of the world with Al Gore. The people have been frightened into believing a bunch of blury idieas that were later discovered not to be true. The evidence is there but the public belief is slow to change.BUT ! The consequence of the hole anti carbon propaganda are really good. More renewable energy is being used.